I almost passed on the opportunity to review this disc. After all, the initial premise did not look that promising, aside from a curiosity. A Grieg rewrite of Mozart? Sure, Mozart did it to Handel, and other composers have certainly not hesitated to throw their own thoughts at other artists with little or no compunction about what they are doing. And to tell the truth, I had only a small degree of confidence that Grieg was up to any task involving the “improving” of Mozart piano sonatas, and well, why would anyone even want to attempt such a thing, as this is not one of those cases where the need to bring an otherwise unobtainable work into more easily procured circumstances makes it more accessible—quite the opposite, in fact. But I am glad I opened this disc, as it contains some absolutely magical music. 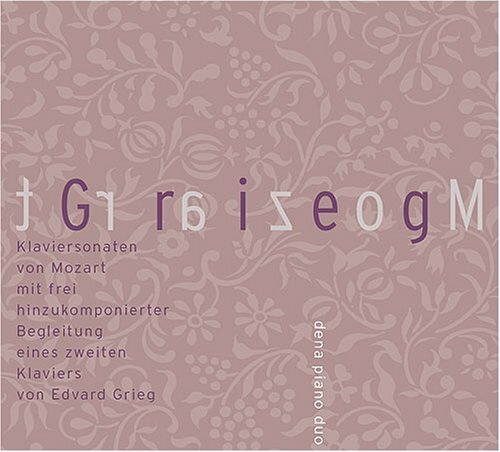 What Grieg did, after years of long study of Mozart, and much experience in the performance of his works (Mozart was his idol), is to compose a “secondary” part to four of the 19 piano sonatas. He did not touch the originals, but added a completely new part for the second piano, embellishing, adding much ornamentation and filigree, and in some cases, most noticeably in the K 545 sonata, created a completely different emotional tone, and one that is not unwelcome. Grieg’s own comment was that “Much of it sounds excellent; so good, in fact, that I have reason to hope that Mozart will not turn in his grave.” Only out of pleasure, dear Edvard. The results of this tampering are simply a case of compassionate Romanticism; this is Grieg’s tribute to a great composer, one who meant more to him than anyone else, and a conscious melding of two epochs into one synergetic form. Mozart shines as brightly in these works as he does in the originals, with the added attraction of Grieg’s own era interjected in a way that causes Mozart’s music to glow even more as Grieg’s additions prove the unwavering strength of Mozart’s pristine compositions. It is truly an amazing thing to hear Mozart and Grieg speaking as one voice, and the 34-year-old Grieg was rightly pleased with his accomplishment. Heide Gortz and her one-time student Tina Margareta Nilssen give exemplary, fully satisfying accounts of the music from the standpoint of both composers, neither overdoing the Romantic issues nor underplaying the Classical ones. The recorded sound is excellent, good reverberation and nicely spaced acoustics that sound even better when subjected to Super Audio surround sound. This disc has been burning up my player, and I can’t keep this stupid smile off my face when hearing it. A hands-down double thumbs-up!